During the 16th and 17th centuries beautiful wide detailed borders graced many tapestries. New style and techniques in the design of tapestries was employed, often a rich foreground with a distant castle giving perspective to these tapestries. The magnificent series of French Royal Palaces is found in this selection. Chateau de Chambord, Versailles, Bellevue and others. Also the Royal Arms of England, a number of hunting scenes and seasons feature here. 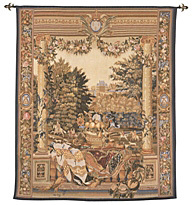 A large range of Renaissance tapestries and designs are available for purchase at Classic Tapestries. Not all are available for viewing on the website. We welcome enquiries. Please contact us for further designs. From a series featuring French royal palaces. The original tapestry was woven at the Gobelins workshops. Loom woven. 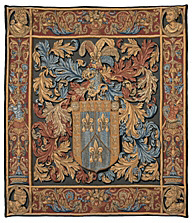 Originally woven in the 16th Century for the Royal Court of England in Enghien, Flanders. Loom woven. 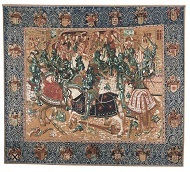 This tapestry was originally woven around 1550 is now on display at the Museum of Bruges Loom woven. This hand woven tapestry shows the palace in winter and was originally woven in the 17th Century at the Royal Gobelins Workshops. This is a magnificent hand woven tapestry. 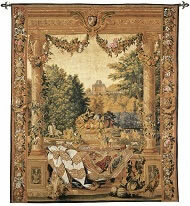 This hand woven tapestry, now at the Museum of Pau in France, shows the Chateau of Versailles in spring. Hand woven. This tapestry shows the renaissance chateau at Chambord in the Loire Valley. Woven as one of a series of Les Maisons Royales in the 17th century. Loom woven in French Flanders. 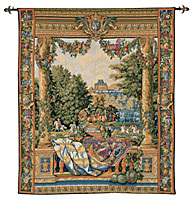 Reproduced from the series of tapestries depicting the Royal Palaces of France woven inthe late 17th century. The famous Palace of Versailles, built in the 17th century was the principle residence of the French Kings and the seat of government for over 100 years. 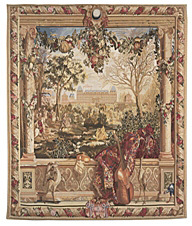 From a series of tapestries depicting French Royal Palaces, and representing the twelve months of the year. This view of the ancient Palace of Versailles represents the month of April, and was woven at the end of the 17th Century at the Royal Gobelins Manufactory in Paris, Museum of Pau, southern France.